According to canine intelligence experts, the average dog recognizes and understands about 150 human words. Talking directly to your dog serves a variety of purposes, but there’s a special advantage when it comes to dog training. Teaching basic commands is not only fun and rewarding, it can also prevent injuries and inappropriate behavior. Keep dog training sessions short (no more than ten minutes at first). Always reward your pup’s efforts. 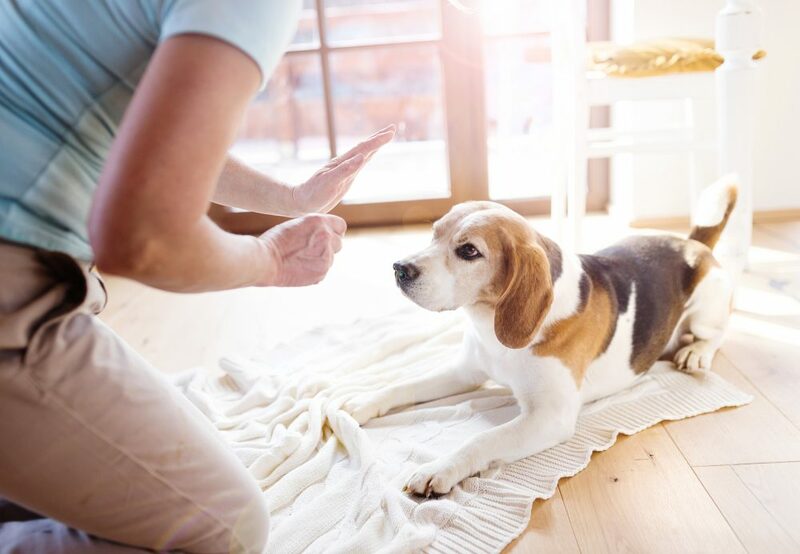 Dog training should never be stressful, even when you’re correcting unwanted behavior. Instead of inducing fear, simply assert a firm “No!” and then move on. Always finish your sessions with a success. If your dog is having trouble grasping a new command, end with one he or he knows very well. Praise your dog, and he or she will look forward to new opportunities to learn from you. A mainstay in dog training, this command is extremely useful. It often requires a little hands-on encouragement, but in time, your dog will understand what you want when you touch his or her backside. Remember to reward your dog regardless of whether he or she needs extra assistance. This basic command is made easier once your pup responds to “sit.” You want your dog to stay put while you take a few steps back, but this requires trust and patience – for everyone. Often, placing your open hand facing your dog will help keep him or her in one spot. Don’t worry if your pet’s response doesn’t quite meet your expectations right away. Teaching your dog to walk alongside you is one of life’s greatest joys. Traditionally, heeling takes place on your left side, but choose whichever side works best for both of you. In your opposite hand, hold treats or a toy. Make sure your dog is watching that hand closely while in step with you. Learning this command may take some time (and lots of patience), but after a while, you’ll both be in step! A great moment in dog training is when your dog actually comes when called. Get down on your dog’s level, open your arms wide, and call. Reach out and offer a gentle touch to the head, back, or belly. Provide lots of praise and encouragement throughout. If your dog doesn’t come when called, walk over to him or her and attach a leash. Then walk back to the spot you were previously waiting. Give your dog some praise and encouragement, and try it again. Tasty treats can be quite persuasive to a dog who would rather be up and jumping around. Apply gentle pressure to your dog’s shoulders and hips, repeating the command until he or she is down on the ground. Stretch the treat out in front to achieve a full, restful position. Don’t hesitate to contact us with questions about dog training tactics. The Pet Experts at Naperville Animal Hospital are always happy to help!